The Pearl Farm is the countryâ€™s ultimate beach hideaway. This beach is located on the Island Garden City of Samal, which is off the coast of Davao City. There are many routes to Samal. One is via the Marina; another is via the wharf near Magsaysay Park. The locals are usually helpful and knowledgeable about such routes. Upon arrival at the Pearl Farm, a pristine, almost untouched beach set against a backdrop of a panoramic hill will welcome you. Of course, there will always be a friendly and warm staff that will accommodate and assist the arriving guest. 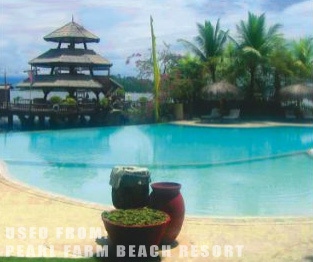 You will be taken to either one of the 19 Samal houses or one of the six Samal suites. A Samal house is designed to appear like native stilt houses of the seafaring Samal tribes. Thus, each hotel room is decorated with native arts and crafts, yet the hotel rooms are fully air-conditioned and furnished with modern amenities. Each room is built in such a way that the guest will have an unobstructed view of the ocean. And no hotel-type room is adjacent to another. This contributes to the ultimate privacy of the guest. If you want to be adventurous, you can go jet skiing or scuba diving. With a banca (local name for a rigged boat), you can go further into the sea and find great diving sites that show off amazing coral gardens and varied marine life. You will surely be tempted to take up underwater photography. Then, as the sun dips down at the horizon and upon going back to the Samal house, you will find a jar of water and a coconut shell dipper at the entrance. You can wash away the sand using this water. By doing so, you are following the symbolic ritual of cleansing the spirit. Inside the stilt house, you will find gentle sleep due to the lullaby of the soft waves.